Glyphosate testing on urine and food products, carried out by the Portuguese No GMO Coalition in cooperation with the Detox Project, has revealed much higher levels of the World’s most used herbicide in Portugal than in other EU countries. There has been a heated political and public debate since the release of the results in Portugal and the state-owned TV channel RTP has covered the story all week (see video of top headline news here). Glyphosate, which is a probable human carcinogen according to the World Health Organization’s cancer agency IARC, is the most used herbicide in Portugal, as it is all over the World. More than 1600 tons of glyphosate are sold every year in the country which, beyond agricultural use, is also sprayed widely in urban areas both by local councils and gardeners. 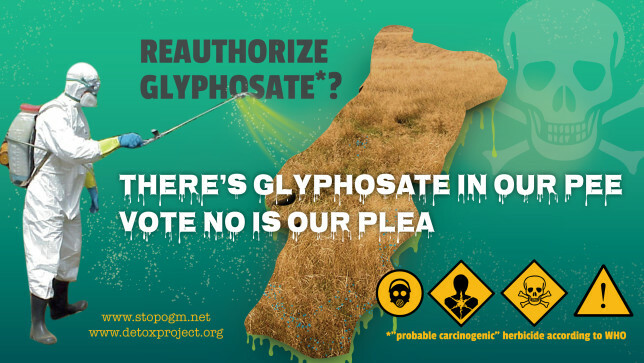 It has been over ten years since any official testing for the presence of glyphosate in food, soil, water, air or people was conducted by the Portuguese authorities. This unprecedented void was partially filled last week with the publication of urine analysis results from 26 Portuguese volunteers as well as some food samples. Although Portugal’s Ministry of Agriculture monitors food annually for the presence of over 300 pesticide residues, glyphosate has been excluded from these analyses. The same goes for tap water, since the Ministry does not include glyphosate in the list of substances to be tested by utility companies. When formally asked at the beginning of this year, the Ministry produced no test results, not even those required by European Union regulations, claiming theoretical modeling showed routine analysis was unnecessary. The testing comes at a crucial time for glyphosate in the European Union as member states are set to vote later this month on the re-licensing of the chemical, which is the base of both GMO and conventional agricultural systems. The LC/MS/MS method used for this glyphosate testing in urine, at a U.S. based University laboratory, is recognized by regulators and mainstream science worldwide for producing accurate results on herbicides and pesticides. Previous testing methods, such as the ELISA method, used by some NGOs have been questioned by many due to the fact that they can give irresponsible and inaccurate results. 26 volunteers were tested by the Portuguese No GMO Coalition, glyphosate was detected in 100% of the urine samples. In Switzerland, in 2015, a similar testing program detected glyphosate in 38% of cases and, in 2013, sampling carried out by Friends of the Earth in 18 European countries showed 44% of the people to be contaminated. In 2015 the results from the testing of 2000 urine samples from Germany found an average of 1.1 ng/ml and a highest level of 4.2 ng/ml..
– the values above 20 ng/ml are, according to the available literature, the highest concentrations ever found in people with no professional exposure to glyphosate. Some food samples were also analyzed with the support of The Detox Project, using a U.S. based laboratory and an LC/MS/MS validated testing method. Stone-Age industry funded science suggested that the higher the dose of a chemical the more dangerous it was, however modern independent science has discovered that many toxic chemicals have as much or more of an influence on our health at low doses– these chemicals are known as hormone hackers (endocrine disruptors). A study from March 2015 stated that the health costs to the European Union of hormone hacking chemicals is over $ 150 Billion per year! The study stated that lower IQ, adult obesity and 5% or more of autism cases are all linked to exposure to endocrine disruptors. Glyphosate is likely to be one of these hormone hacking chemicals according to independent science. Find more information on this here. I thought the EU did not use Glyphosate. This info is shocking! Good to know that Russia has outlawed GMOs/Glyphosate and Putin has promised to make Russia the #1 world grower of organic foods! Maybe the EU will be able to import food from Russia in the future. The demand for organic foods in the US is grater than the availability why we import organic foods from other countries, b/c it takes farmers 3 years to transition into organic farming. Monsanto, the manufacturer of Glyphosate, is destroying the US economy and our health! 1 in 2 men and 1 in 3 women get a cancer diagnosis during their lifetime! In 9 yrs from now, in 2025, 1 in 2 newborn will have autism b/c we are all saturated with chemical poisons, pregnant women too! The Monsanto executives should be in prison for crimes against humanity!! !